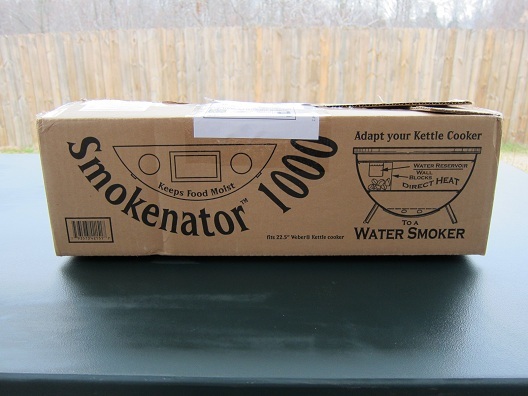 For this week’s review I was sent the Smokenator 1000 from Jennifer Thompson at Barbecue Kettle Accessories. 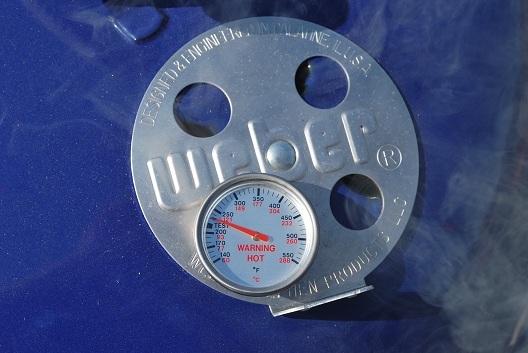 Barbecue Kettle Accessories was established in 2004 to manufacture and distribute the Smokenator. The company is located in San Jose, California in the heart of Silicon Valley. 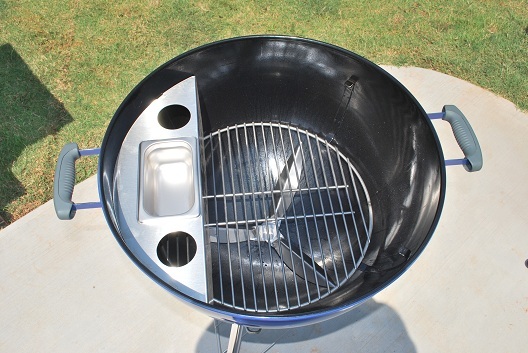 The Smokenator 1000 is an 18 gauge stainless steel insert that fits in the lower part of a 22.5″ Weber kettle grill and transforms it into a smoker. This setup frees up space since it’s only 6″ wide and delivers true indirect cooking. 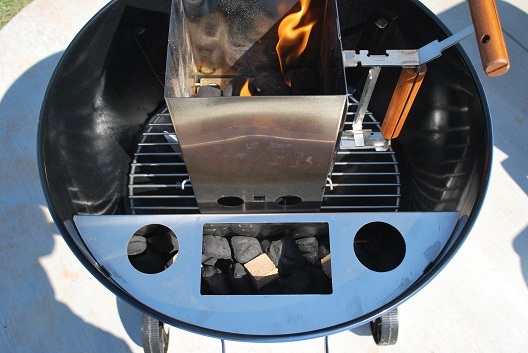 The Smokenator contains the hot charcoal while channeling the heat upward and shields food from the direct heat. The chamber of the Smokenator holds enough briquettes for about a 6 hour cook at 230° F at the dome. The Smokenator also makes it so the food is cooked by convection and gentle radiation through the 18 gage stainless shield. A water pan rests on top of the charcoal which is the most efficient way to fill the kettle with high humidity. This humidity keeps food moist and helps to keep the temperature lower and more controllable. This also helps to ensure a nice deep smoke ring penetration. 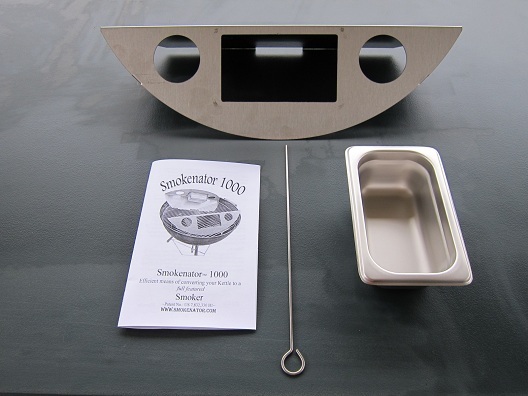 Included in the Smokenator 1000 box was the baffle, water pan, skewer and instructions as seen in the picture below. The first thing I did before I used the Smokenator was to make sure my grill was clean. With the grill grate removed I then placed the Smokenator in the lower left side of the kettle. I then removed the water pan and placed around 48 Kingsford charcoal briquettes and some of the new cherry Mojobricks Bar-B-Qubes inside the Smokenator. After that I took 12 Kingsford charcoal briquettes and lit them in a charcoal chimney until they were ashed over. Once those 12 briquettes were ready to go, I spread them over the top of the unlit charcoal and Mojobricks Cherry Mini-Qubes inside the Smokenator. Then I filled the water pan with water and placed the grill grate back in place. Once that was done I made sure the lower vent of the kettle was fully open and then adjusted the upper vent opening to 5/16”. I placed the kettle lid on with the upper vent opposite the Smokenator and slid a thermometer through one of the upper vent holes. After the temperature registered around 230° F I removed the lid of the kettle and placed in a 4 1/2 pound beer can chicken. 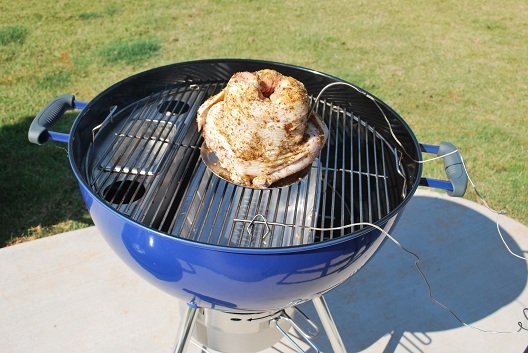 Then I inserted a meat probe in the thigh of the chicken and attached an ambient temperature probe onto the grill grate and then placed the lid back on the grill. The grill stayed at around 235° F at grate level and around 255° F at dome level for the full cook, which was about 3 1/2 hours long. I also didn’t have to adjust the top or bottom vents at all during the cook. I checked the water pan every hour and added water as needed. I also used the included skewer to stir the coals about every hour since this knocks the ash off and the result is a more consistent burn rate for the charcoal. 2 hours in I rotated the beer can chicken 180° and basted it with some beer. 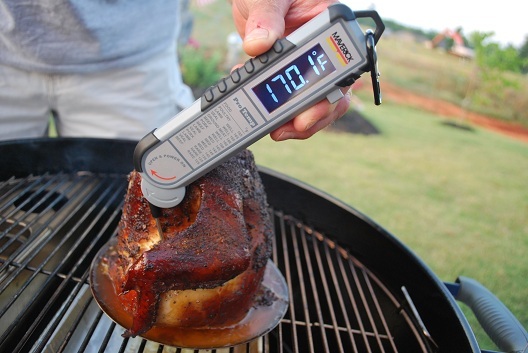 Then around the 3 1/2 hour mark the beer can chicken registered at 170° F, so I removed the meat probe and double checked the temperature with my new Maverick PT-100BBQ Pro-Temp Thermometer. After that I removed the beer can chicken from the grill to take inside the house to rest 5 minutes before serving. The chicken was very moist and tender and it also had a great smoke flavor to it. I wasn’t sure how well the Smokenator 1000 would work since I hadn’t used an insert like this up until now and I have to say I am extremely impressed with how well this product worked. I never had to adjust the vents at all during the 3 1/2 hour cook and the temperature of the kettle stayed at around 235° F at grate level and around 255° F at dome level for the full cook like I mentioned above. I also didn’t have to add any more charcoal to the Smokenator during the cook. 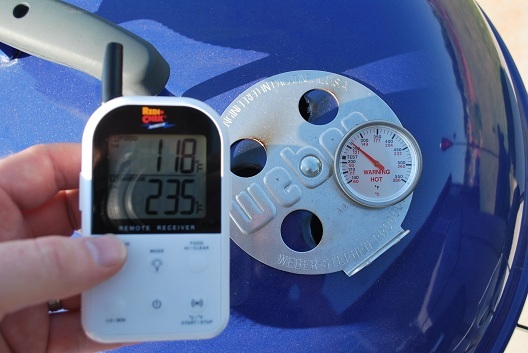 I used my Maverick ET-732 to monitor the temp of the meat and the grill at grate level, so the only time I had to go outside to check on the grill was to add water twice to the water pan and stir the coals about every hour to knock the ash off. With the Smokenator 1000 you can do about a 6 hour cook at 230° F at the dome with the max of 60 charcoal briquettes that it will hold, so after that you will have to add more charcoal for those longer cooks. The Smokenator comes in 3 sizes and fits in the 18.5″, 22.5″ and 26.75″ Weber kettles. If you’re someone who owns a Weber kettle grill and are thinking about getting a smoker be sure to look into the Smokenator and get a great product you can use with your existing kettle grill. You can find a great deal on the Smokenator 1000 here . For more information on the Smokenator 1000 please visit their Facebook page as well as their Website. Glad to see a review of the Smokenator, Jay ! I bought mine a year ago, I’ve used it to smoke ribs and my Christmas turkey. This is a great product, specially to get used to smoking without buying a more expensive smoker. Thanks Nick! I really enjoyed doing a review on it! The cool thing is a lot of people own a Weber kettle grill and this turns it into a pretty great smoker for such a little amount of money. I own a 18.5″ WSM and the Smokenator did a better job of staying at a constant temp then my WSM does. Like I mentioned above I didn’t have to adjust the vents at all the full cook. I’m pretty impressed with the Smokenator! Thanks for leaving a comment Nick! I think it’s definitely worth looking into John. You really can’t beat the price on it either. Enjoy that new red performer man! I’ve had the blue one for a few years now and love it! Thanks for leaving a comment John! You beat me to it Jay! 🙂 I’ve got one coming to me for my 26.75″ kettle that should be here any day. Awesome review man. Appreciate all the hard work you put into the site! Thanks Steve! I really appreciate the nice comment! I’m glad you liked my review. It’s a pretty sweet product and I like the fact that when I’m done using it, I can store it in my garage and it doesn’t take up a bunch of room like my other smokers do. I was very impressed with it and I can’t wait to use it again! Thanks again for leaving a comment! Enjoy your new Smokenator 2600! A well written review, Jay. With your descriptions and good pictures, it’s very clear what the Smokenator is and how well it works. 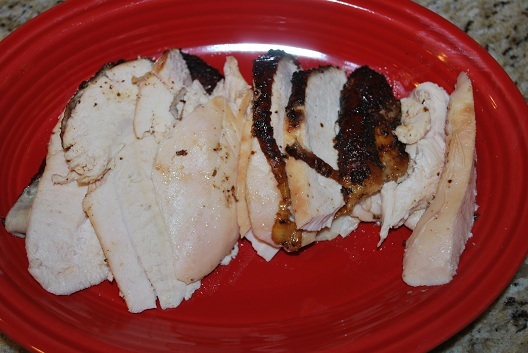 Along with beer can chicken, I love smoking turkey breasts on my Weber Kettle too. Oh, and your chicken looked awesome! Thanks so much Brian! I appreciate it! It was a really fun review to do and the beer can chicken was the best I’ve cooked thus far. Thanks for leaving a comment Brian! Very neat. I have been waiting on your review on this one. Now, do you notice that the temp being hoter on one side of the grill than the other or does it distribute evenly? Thanks for leaving a comment Kevin! The Smokenator does seem to distribute the heat evenly from what I could tell during my beer can chicken cook. When you use the Smokenator you have to make sure to have the top dome vent at the opposite side of the Smokenator. I had no problems with temp control at all while using it. I opened the vents to the recommended settings at the beginning of the cook and never had to adjust them at all the full 3 1/2 hour cook. Like I mentioned above I am extremely impressed with how well it worked and I definitely recommend this product! Thanks for the review. I’ve been going low and slow after, ironically, reading meathead’s beer can chicken debunk article . I just stack the coals on the side and do minion. I think this will help. Just have to find it in Sweden! Thanks for leaving a comment James! great review jay,as well sounds like a great product.. Thanks Dave! I appreciate that! Started off being extremely impressed although there are a few “control” issues one has to work out with proper venting to keep temparature. However, I found maintaining the temperature where I needed it after 3 hours was difficult. I guess these are things I need to work out with my weber. Would like to find out how to maintain temp for longer period of time.